Leaning in and dropping off. One of the things I love about summer is that I have time to do things that are more of a challenge during the school year. I have two big goals this summer (besides have a great time and make the most of every day). One is that I want to declutter my house. Last year with my health issues, things didn’t get done the way they normally do. Then there is the issue of the job becoming overwhelming. Regardless of how my house turned into a pre-quel to Hoarders, suffice to say it needs some decluttering. The other goal I had is to clean up my diet. Don’t get me wrong. I eat a healthy diet overall, but I have some issues I’ve wanted to address. I’ve been dealing with the headache issues for 18 months now and it’s time to start eliminating things from my diet that may be causing issues. The thing is, I know from experience that I am not the kind of person who can take my life and completely turn it upside down and inside out in one fell swoop. I am a super Type-A personality and that means that if I can’t do it “right” then I get frustrated at myself, which makes it harder to make the change stick. This was how I finally lost my weight; by making small sustainable changes that resulted in weight loss and fitness and health gain. So what I am doing is Leaning In and Dropping Off. I am leaning into clean eating. My diet is already mostly clean, but I want to clean it up more. In essence, I want to declutter my diet as I declutter my house. Leaning in means that I am making small healthy changes that will result in a clean diet. It won’t be clean tomorrow, or even the next, but I am hoping that by 2014 will be a mostly clean diet. Found recipes that are foods that my husband and I already enjoy, but are “clean”. Set up simple meal plans with the plan of using them to guide our days, but not as hard and fast “diets”. For example, in the Journey Nutrition site I can click on “Find Meal Plan” choose the calorie level I’m looking for, and add or remove foods I do not want to see in my plan, and then go through completely vitamin and mineral balanced meals and choose them for my weekly plan. I choose meals that are simple whole foods. If it’s close and has something that I’m not eating I just swap that food out for something I prefer or have on hand. I have increased my CSA (Community Sustained Agriculture) boxes from Klesick Family Farms to once a week from once every other week so I have fresh, organic, mostly local fruits and vegetables available at all times. I have started a blog at www.cleanleaning.com to talk write about my ups and downs because I need places to put my feelings and successes. Pre-made foods that I bring into the house have only ingredients I can buy at the store. Eventually I want pre-made foods to drop off. I am researching ways to make things myself. I already make my own yogurt and bread, but want to learn if I can reasonably grind my own grain and things like that. Leaning, to me, signifies the necessary changes that I need to make to keep my body in tip top condition, nutritionally. Bonus, Roy lost five pounds in the first week! I still eat a few processed things that I already have (cereal is one thing). Dropping off is something that one of my Facebook (and real life) friends talked about in her response to a nutrition discussion we were having. She said that she just let Gluten “drop off” of her diet. Rather than finding something to replace the foods that were causing her stomach issues, she just let things slowly drop off of her diet. That makes so much sense to me. One of the things I often see, and I think this is okay at the beginning of changing our nutrition, is that people who are on, for example, a no gluten ‘diet’ try to replace the cookies with wheat, with cookies without wheat. In other words, the better way to do things is to drop those foods off of a regular diet, not find a way to replace them. Let me be clear, I would rather see someone find a replacement that is healthier if that works better than saying “You can never eat a candy bar again…ever.” When I started my weight loss journey I replaced very frequent candy bars with smaller, lower calorie granola bars. They were not healthy granola bars, but they were healthier than the candy bars and eventually they dropped off my diet because they served their role of transitioning me to a better place. Artificial sweeteners. I am using Sucanat which is simply dried cane sugar with minimal processing. I also am using Stevia that is minimally processed. I knew this would be a challenge because I like good coffee with sweetener, however I also know that this is not the best for my body. Because of that, soda has all but dropped off of my diet. I am drinking coffee, tea, and lots of water instead. I love a nice cold fruit infused water. This has not been a challenge at all. As I finish off the cereal in my cupboard, that will drop off. I’ve been eating a lot of steel cut oats with fresh fruits and or natural peanut butter. Non-organic foods that I can find in an organic form are going by the wayside. I still have a ways to go, but so far we are both finding the change to be pretty easy. I know that I have struggles that Roy does not have, and vice versa. Ultimately our goal is to be eating a diet that is clean, with some room for treats. I mean come on, cupcakes! Hallo! (And yes, I know I could MAKE clean cupcakes but then I have the problem of having cupcakes in my house, and that’s not ever a good idea.) Perhaps at some point I’ll lean away from cupcakes after a marathon, but for now limiting them is best. I am not choosing to eliminate any food categories from my diet because I believe we all need to eat healthy food. I am still going to enjoy my gluten (although will be looking for sources that are non-GMO), I will eat my carbs because they are healthy. I’m not going to jump on any bandwagon, nor am I going to tell others to do what I’m doing, although if you are in Fit Club I will be having an “Eat Real Food Challenge” coming up. I’m simply choosing what is best for me and my diet at this time in my life. Live Life Active Fitness » Eating Clean – Approved Foods List. This is good to know. Sometimes I think “is this clean or DIRTY??? ?” (You have to imagine me saying “dirty” like “dirhhhhteeeeeee” in a menacing tone.) So I’m looking for sweeteners because I am sweet and sweets love their sweets! I am used to having several packets of Splenda a day in my coffee, on my cereal, sometimes I just snort it off the back of my hand or…okay maybe I don’t go that far. Long story short, I had to have a “Whipple Procedure” (Pancreatic Duodectomy) where they removed part of my pancreas so I have striven to be kind to my pancreas by limiting sugar consumption and avoiding alcohol almost completely. I thought that since Splenda was supposed to be safe (please, I’ve read all the studies I know–I do not have a sensitivity to it) it made more sense than sugar. Plus, sugar is a lot of calories. So I was looking up safe sweeteners. I got some Sucanat and I like it, but it’s caloric and I’d like to have an alternative so that I can wean down off of drinking sweet coffee. I stumbled upon this page and thought I would share it! So far so good today…breakfast was steel cut oats, almonds, currants, and banana. I tried another way of cooking it in the microwave which I won’t share because it didn’t work very well. I might as well have put it on the stove. Lunch was chicken chili; black beans, chicken, onion, some spices. It didn’t look pretty because of the black beans but it tasted great. I cooked down a chicken carcass for the broth and learned a very important thing–take the carcass out BEFORE adding the beans. So outside of having to pull the odd vertebrae from betwixt my teeth, it was good! I added some light sour cream (no additives, made only of milk) and we had some honeydew. Dinner is ready! Off to eat! I belong to this awesome new social media page called LifeKraze. Every day you post what you did and receive points. Then you have 300 points per day to award to others for their accomplishments. You get points for your accomplishments, and for rewarding others. It’s a great way to encourage people to make healthy changes. Define Bottle with berries. Yeah, I dig coffee too, as you can see. The points can be used to get % off on sponsoring companies, so I spent some of mine on a Define Bottle. It was interesting to me for two reasons. I am trying to drink water and I love fruit infused waters, and it was developed by a 13 year old boy. Love that part especially. 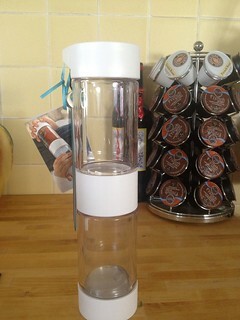 It is BPA free and comes apart. It has a little ice pack that you freeze, a section to put fruit in, a separator that keeps the fruit from falling into your face when you drink, or clogging up the hole. You add water, screw on the top and ta-da! 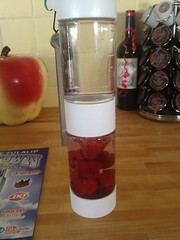 Fruit infused water to GO! Here are a few shots, and of course you can go to their webpage and see some actual professional shots. I have fresh strawberries from my garden in there today! Super clean and pretty to boot! How to Cook Steel Cut Oats in the Microwave – Oatmeal Project Day 12. Used this method this morning for cooking steel cut oats in the microwave. I have Bob’s Mill oats (big bag for sale at Costco). I cooked 3/4 cup oats with 2 1/4 cups water. Cooked on high for 3 minutes, then once it was boiling just tapped the +30 seconds button after letting it boil down a bit. I think tomorrow I’ll go to cooking it on low for awhile. I also think I will reduce the water. It tasted great, though. Added some chopped almonds and fresh from the garden strawberries. Even Roy ate it and said it was good! This is, by far, the best food logging site I have found. So good, in fact, that I use it with all of my Journey Fit Club clients. It tells you full nutrition information for what you are eating. There is a “grade” for each of the micro and macronutrients. But not only does it tell you how well you’re doing on nutrients, it gives you suggestions for improvement. For example, let’s say I’ve set up my daily journal and I notice I have a B- with a down arrow for Iron. (Down arrow means you’re too low, up arrow means you have taken in too much.) I can click on that B- and it will show me, in order of highest to lowest in nutrient, everything I’ve eaten so far. Scroll down and you’ll see lists of foods that are high in that nutrient. One of the features I’m using to lean into clean is the menu planner. I can click on the menu planner, put in my desires (for example, if I wanted to have a vegetarian menu I could click “no meat”), and it will take menus created from other users (thousands of them) and present them to me. So for this first week, I am eating between 1500-1800 calories. However, I wanted some wiggle room, so I asked it to pull menus that were close to 1200 calories and have all “As” in main nutrients. I then went through the menus and selected one full menu for each day. It doesn’t mean I have to eat that, but it’s a good start. So for today, breakfast was supposed to be an egg, oatmeal, and toast. That’s not really what I wanted, nor is it clean (but the other meals snacks were good), so I replaced breakfast with Greek yogurt (homemade), strawberries, and a little bit of granola (because I knew I was going for a run after breakfast and needed some carbs). While the meal wasn’t 100% clean, that’s okay. It was all healthy choices, the granola is organic, and it tasted great. I also had some coffee with sucanat and organic half and half. Not as sweet as normal because I usually use two Splenda, but still good coffee. The yogurt and berries were sweetened with stevia drops (minimally processed). No white stuff–this includes flour, sugar, and other highly processed things made out of white stuff. Eat mostly fruits and vegetables. Whole grains. Some will say no gluten, but gluten actually has some great nutrients available and if you’re not intolerant or celiac, no reason to remove it from the diet. Read labels and choose foods with less than 5-6 ingredients. Be aware the “natural flavoring” may not be what you and I would consider natural. Clean your pantry so that you have only clean foods available. Okay now my rules for LEANING into Clean. Limit white stuff. Bread is okay if I make it myself. Fortunately I’ve been doing this for quite awhile. I will finish up the white flour I have and find whole grain and organic resources. Wean off Splenda and learn to like Stevia and other less processed and natural sweeteners. Choose lean meats. This is easy because we already to lean meats. Lean ground can be made juicy by adding chopped up mushrooms and onion. You will not taste the mushrooms and the onion gives it a great flavor. Try new grains in a variety of ways. Enjoy the heck out of gluten because I like it, it doesn’t bother me, and I’ve yet to be convinced that eliminating gluten is healthier. However, I do like that there are new alternate flours on the market! I’ve long made cobbler with a combination of wheat flour and almond flour and it is to DIE for! Find reasonable substitutions that are cleaner and less processed. Read labels and not only use that to decide if something is “clean” but also find out what kind of company is behind it. Try to avoid companies with histories of false claims in their advertising. Eat 6 small meals per day. I already do this. I call it the Hobbit Diet. Basically I take what I might eat at three meals and spread it out. This avoids hunger and keeps my energy high. Plan a treat once a week that may not be clean, keeping in mind that I might find a better way to enjoy this! For example when I first started on WWers I would eat a DQ Banana Split every week. I saved my points and enjoyed it. After awhile I moved to No Pudge Brownie Sundaes with NP brownie and a half cup of lowfat ice cream and whipped topping. Finally I settled on a nightly snack of homemade yogurt and sweetened berries. Making subs that I enjoyed made it easier for me to move from unhealthy to healthy options. Be patient with my husband. He is not nutritionally focused like I am, and that’s okay. Never ever ever make someone else feel small or less accomplished if they are not eating like I am. So there we go! As I move into week one of the challenge I am feeling like “Okay, I can do this!” This morning I had french toast made with organic eggs, fresh bread I made myself, and organic milk. I realized, though, that I don’t have a good alternative for sugar free syrup. Maybe maple syrup in smaller doses. One of my first goals is to find a sweetener that is low in calories and doesn’t taste funky. 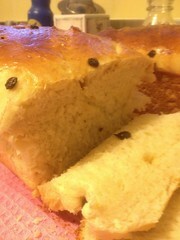 Mmmm…french toast made out of Portuguese Sweet Bread that I made myself. …about making small, sustainable choices to transform a good diet into a great one!